I love the way a basic t-shirt fits my body. But seriously, they aren't very stylish, which is why I am always trying to find ways to make them cute! 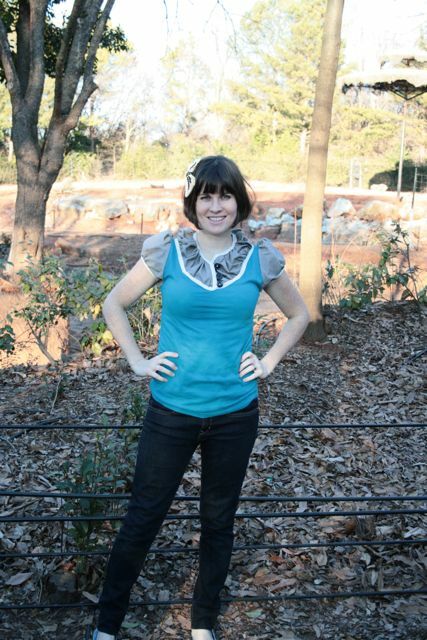 (As seen here and here and here.) So here is my latest! 1. 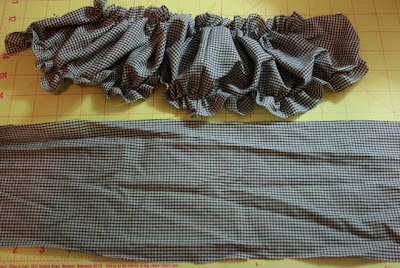 Create a strip of fabric that is 54" long (I was using a men's shirt so I just cut two pieces and sewed them together) and 5 inches wide. 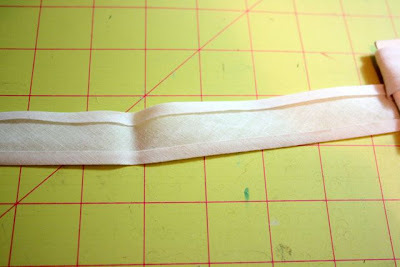 2. lengthen your stitch (on your machine) to a 4 or 5 and then sew one line 1/4" from each of the long sides of your 54"x5" strip. 3. pull those strings to gather up the strip. 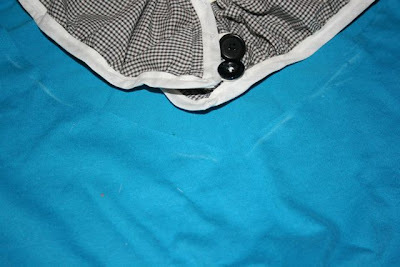 4. trim the excess pretty close to the stitching w/o cutting the stitches. 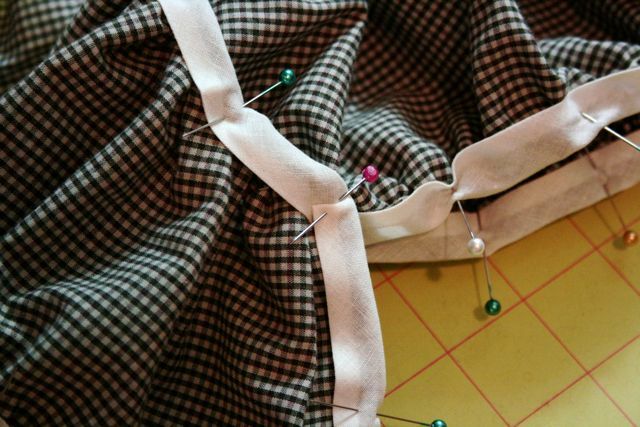 Now get out your bias tape (that stuff that you see near the thread and zippers in the fabric store). 5. 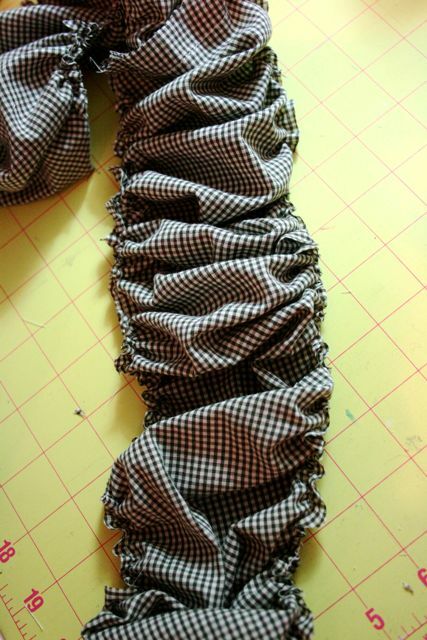 Mine was some vintage cream single fold, so I had to fold it over (as shown) and press it in half with my iron. 6. I then took the bias tape and sandwiched the folds around the raw edges of the gathered strip (and I pinned it obviously). 6. 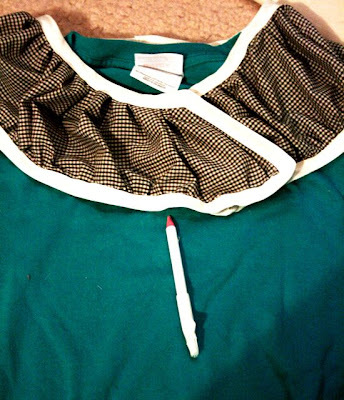 I then laid it on top of my t-shirt, around the collar as I would want it to be placed. 7. Then I took a fabric/sewing pencil and outlined the outer edge (where I would want to cut the t-shirt collar off). 8. Can you see that faint line where I had sketched? (I moved the gathered piece up from it so you could see.) That is where I cut the t-shirt. 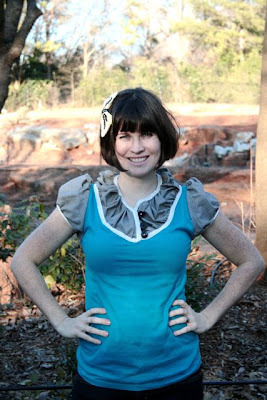 note: I only cut the front, not the back, I wanted to wait until I had sewn it on to cut the back off. 9. 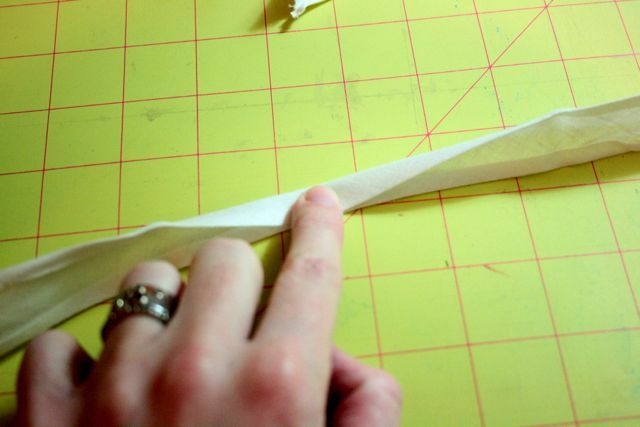 You can do this part earlier or later than now, but I am going to insert this part of the tutorial in now. 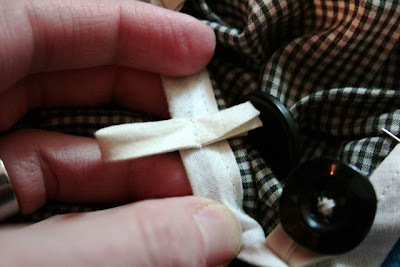 You need to sew 3 strips of bias tape into loops for buttons. 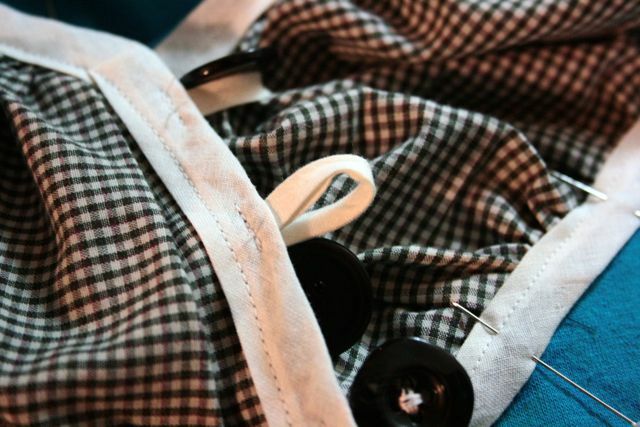 Sew them on. DON'T PUT THE BUTTONS ON UNTIL THE END (I had to re-do mine). 10. 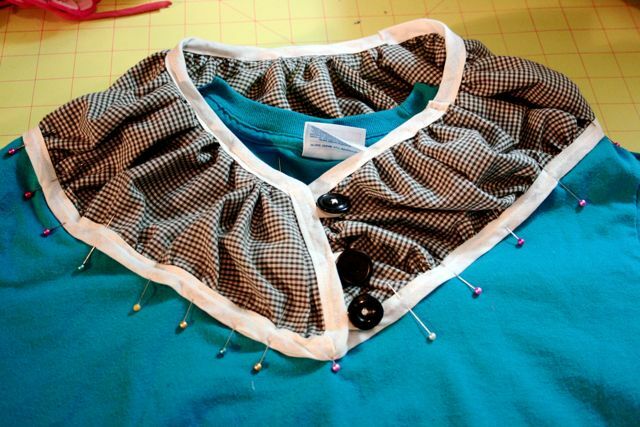 Put your t-shirt on and get a feel for exactly how you want your collar to lay and then pin it down. (or you can just sew it exactly how you drew it on the t-shirt, but I found that mine needed to be tweaked a little bit and I ended up overlapping the ends more than I had thought). 11. Sew it in place, and then put in your buttons so that they correspond with the loops. I love this! I have a feeling mine wouldnt come out so cute if I tried this, but I just might go for it anyways. VERY cute! Love what you did, its so chic and stylish! Great transformation! and you look great pregnant! This one is my favorite. I love your hair.